Looking for a refreshing way to end a Spring meal, or a wonderful twist on a Brunch favorite? 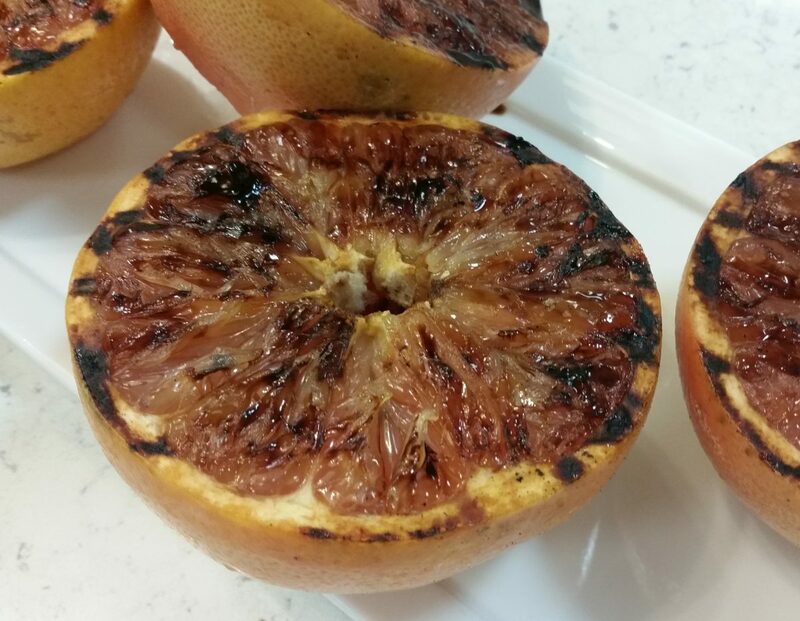 Try these Grilled Pink Grapefruit with Tamari Maple Glaze! The end of winter and the beginning of spring are the peak of the grapefruit season. As a child I remember getting presents of bags of oranges and grapefruit from friends and family that had visited Florida to get away from the Northern winters. We would slice them in half and then pull out the grapefruit spoons with the serrated sides and pointed tips to help cut each section out from between the membranes. If you didn’t happen to inherit Great Aunt Josephine’s silver set complete with grapefruit spoons, you can cut the segments away with a small serrated knife before service. Or try looking through the flatware bins at thrift stores, you’d be surprised how many grapefruit spoons are there! This recipe features beautiful pink grapefruit halves with grill marks that make a dramatic presentation for brunch. The Maple Tamari Glaze gives just a hint of sweet and saltiness that is almost reminiscent of bacon! Cut grapefruits in half around the equator of each fruit. Heat grill or grill pan to very hot. Mix together the maple syrup, tamari and sesame oil. Brush the Maple Tamari Glaze across the surface of the grapefruit. Place cut side down on the grill for 1 minute. If cross-hatched grill marks are desired lift the grapefruit and turn 45 degrees, placing it down on a different portion of the grill. Remove after 30 seconds. Using a grapefruit spoon or a small serrated blade, cut the grapefruit sections away from the rind. Brush the top with additional Maple Tamari Glaze and serve. Optional method: remove the peel and rind and cut each segment out. With or without grilling, dress the grapefruit sections (along with other citrus and cut fruit) with the Maple Tamari mixture as a dressing and serve as a cold fruit salad. This entry was posted in Food Allergies and Sensitivities, Herbs and Spices, Love Your Veggies!, Peak of the Season and tagged Gluten Free, grilled grapefruit, Maple Tamari Glaze, Pink Grapefruit on March 28, 2016 by Chef Christy.